Some more Comedy Fest news! As part of the 2014 NZ International Comedy Festival in cahoots with Old Mout Cider, grab some friends, or don’t if you don’t have any, and join us for some LOLs from 24 April – 18 May. 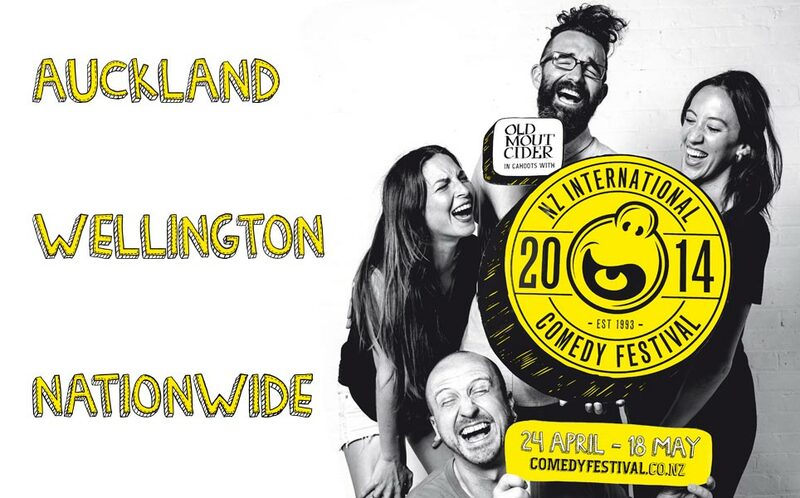 For the full Comedy Fest show line-up head on over to comedyfestival.co.nz but first, check out some of the excellent acts they’ve got for us below. Fresh from Stephen K Amos’ new sitcom radio show for BBC4 (UK), What does the K stand for? revolves around his hilarious childhood stories. Expect big LOL moments with plenty of heart, irreverence and quirk in Auckland (25 & 26, 29 Apr – 3 May) and Wellington (4 May) as part of the 2014 NZ International Comedy Festival. STEPHEN K AMOS in WHAT DOES THE K STAND FOR? It’s been a far few sips between drinks for the team behind internationally acclaimed My Brother & I are Pornstars, but 2014 sees the pairing of Jackie van Beek and Jonny Brugh return on the 25, 26 and 29 April –3 May with FLASHDUNCE – as part of the 2014 NZ International Comedy Festival. Directed by one of New Zealand’s comedic masterminds, Jesse Griffin (7 Days, Wilson Dixon), van Beek and Brugh are excited with their brand new creation; littered with an enormous number of curious characters from a diverse range of worlds. Slightly challenging on The Basement Theatre’s low ceilinged small stage, but nothing is impossible for this duo. Following sellout tours of the UK and critically acclaimed performances around the world, Reginald D Hunter – one of the UK’s most popular stand up comedians – is proud to make his debut this year at the 2014 New Zealand International Comedy Festival from 29 April – 3 May. Originally from Albany, Georgia, Reginald has resided in the UK for over a decade and is a well known face on Television and the UK Comedy Circuit. His popularity has lead to him being invited to perform in venues around the world in places such as Singapore, Hong Kong, Thailand, South Africa, America and Australia. Make sure you don’t miss the brutally honest, frequently controversial but always meticulously measured and thought out comedy of Reginald D. Hunter in his New Zealand debut. See the full Comedy Fest show line-up here: comedyfestival.co.nz.